America's financial regulatory system must be overhauled to strengthen oversight of banks, mutual funds and large financial institutions whose collapse would put the entire economy in peril, Federal Reserve Chairman Ben Bernanke said Tuesday. "We must have a strategy that regulates the financial system as a whole, in a holistic way, not just its individual components," Bernanke said in a speech to the Council on Foreign Relations. In his most extensive remarks on the subject, Bernanke built upon previous suggestions to bolster mutual funds and a program that insures bank deposits - and repeated his call for Congress to create a system to cushion fallout from the failure of a big financial institution. The Fed chief's remarks come as the Obama administration and Congress are starting to crafting their overhaul strategies. For the administration, critical work on that front will be carried out among global finance officials this weekend in London. That will help set the stage for a meeting of leaders from the world's 20 major economic powers in April. Revamping the U.S. financial rule book - a patchwork that dates to the Civil War - is a complex task. Congress, the administration and the Fed are involved because they want to strengthen the system to prevent a repeat of the financial crisis - the worst since the 1930s- that has plunged the U.S. and many other countries' economies into recession. Bernanke said the U.S. recession could end this year only if the government is successful in getting financial markets to operate more normally again. The recession, now in its second year and already the longest in a quarter-century, has turned out to be more severe than the Fed had anticipated, he acknowledged in fielding questions after his speech. To guide the regulatory overhaul, Bernanke laid out four key elements. One is for Congress to enact legislation so the failure of a huge financial institution can be handled in an orderly way - similar to how bank failures are handled by the Federal Deposit Insurance Corp. - to minimize fallout to the financial system and to the national economy. Moreover, such "too big to fail" companies must be subject to more rigorous supervision to prevent them from taking excessive risk, Bernanke said. The Fed is trying to identify "best practices" that can help companies detect trouble spots and best manage their risks. The government over the past year has been forced to rescue major financial companies so interwoven with other players and the global financial system that their collapse would put the entire economy in danger. The bailouts of insurance giant American International Group Inc., Citigroup Inc., Bank of America Corp., and mortgage finance companies Fannie Mae and Freddie Mac have put billions of taxpayers' dollars at risk and angered the American public. 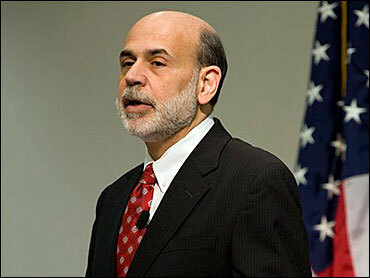 "Government rescues of too-big-to fail firms can be costly to taxpayers, as we have seen recently," Bernanke said. "Indeed in the present crisis, the too-big-to-fail issue has emerged as an enormous problem." Bernanke also said the nation's financial plumbing - the infrastructure and policies that govern financial transactions- must be strengthened to ensure that it will perform under stress. Policymakers should consider ways to bolster money market mutual funds that are susceptible to runs by investors, he said. One approach would be to impose tighter restrictions on the financial instruments that money markets can invest in. Another idea is to develop a limited system of insurance for funds that seek to maintain a stable net asset value. In addition, Bernanke called for a review of regulatory policies and accounting rules to make sure they don't "overly magnify the ups and downs in the financial system and the economy." For instance, he suggested that a larger financial buffer to support the FDIC's insurance program for bank deposits be built up during good economic times so that it could be drawn down when conditions worsen. Finally, the government should consider creating an authority specifically responsible for monitoring financial risks and protecting the country from crises like the current one. Some in Congress - and the previous Bush administration - have proposed that the Fed take on this role of super financial cop. As a lender of last resort to troubled financial companies, the Fed already has a major role in trying to put out financial fires. "Effectively identifying and addressing systemic risks would seem to require the involvement of the Federal Reserve in some capacity, even if not in the lead role," Bernanke said.